The bushmen had a totally different way of looking at this bottle from that of the people who dropped it. Why did they get it so wrong? The following exercise will help us understand what was happening. Consider the following ‘fact.’ Observe it very closely. Now attempt to answer this question about the fact. What do you think this most likely was originally? 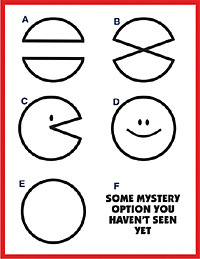 What do you think is most likely missing? Let me help you by offering you some options. See if one of these is one of the possibilities you thought of. 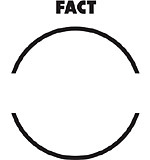 Most people say it was a circle originally, and thus choose option E. However, the correct answer is that nothing is missing, because I drew the ‘fact’ (first illustration pictured above) just as you see it! This simple exercise teaches us a very important lesson about evidence and interpretation. The point is that ‘facts’ by themselves are essentially meaningless—they all need to be interpreted within a particular philosophical framework. Let’s consider our ‘fact’ above. I asked a question: ‘What is missing?’ By doing this I gave people a particular presupposition to use when looking at this fact. If someone accepts this presupposition that something is missing, then they look at the fact believing they have to come up with a solution as to what is missing. Thus, the person is now looking at the fact in a particular way—with a specific belief about the ‘fact’ that they have accepted. 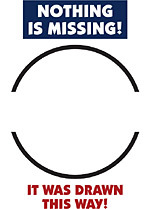 When people say it was a circle, they have actually interpreted the fact in a particular way, consistent with their way of thinking that is based on the presupposition stating something is missing. 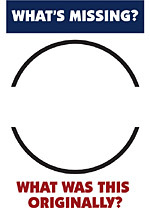 Now the circle interpretation is totally consistent with the person’s way of thinking and is totally consistent with their presupposition—it’s just the interpretation is totally wrong because they started with the wrong presupposition. The problem is that most people have not been trained to even understand that every ‘fact’ has been interpreted by a presupposition that in essence asks a question—let alone whether the right question was asked! For instance, the public reads almost daily in newspapers and magazines that scientists have dated a particular rock at billions of years old. Most just accept this. However, creation scientists have learned to ask questions as to how this date was obtained: What method was used? What assumptions were accepted to develop this method? These scientists then question those assumptions (questions) to see whether they are valid or not and determine whether the rock’s age could be interpreted differently. Then the results are published to help people understand that scientists have not proved the rock is billions of years old, and that the evidence can be interpreted in a different way to support a young age. The bushmen in the movie had the wrong presupposition when trying to interpret the coke bottle. Because they asked the wrong question, they came up with the wrong answer and thought it was something that was evil and must be disposed of. All of this should be a lesson for us to take note of the situation when we read the newspaper—we are reading someone’s interpretation of the facts of world history—there very well could be a different way of looking at the same ‘facts.’ One can see this in practice on US television when comparing a news network that’s currently considered fairly liberal (CNN) with one that is more conservative (FOX)—one can often see the same ‘facts’ interpreted differently! I had the opportunity to explain all of this to a student at a Christian university who was frustrated with one of her professors who claimed to believe the Bible was the Word of God. If the Bible really is the Word of God, who knows everything, and is the true record of history (which it is), then all of our thinking must start with God’s Word. The Bible clearly teaches that God created everything in six literal days.2,3,4 On Day Six, God made land animals (which must have included dinosaurs, as they were land animals) and Adam and Eve. Therefore, on the basis of God’s authority, we should be prepared to say that dinosaurs and humans lived together, regardless of what the world claims. Now, since God’s Word in Genesis is true history, then any evidence, properly interpreted on this basis, will be consistent with observational science. Whereas if the evidence is interpreted on the basis of the professor’s view, that dinosaurs lived millions of years before man, it should ultimately conflict with observational science and thus show a problem with the interpretation. Now here’s the point. No fossils of coelacanths have ever been found in the same layers as human fossils, but they have been found in the same layers as dinosaur fossils—yet we know coelacanths and humans do live together, because they do so in the present world. In other words, just because we don’t find fossils of certain creatures (or plants) together with humans in the fossil record, it doesn’t mean they didn’t live together. Starting with the Bible, and therefore the presupposition that man and dinosaur did live together, we can properly interpret such ‘facts’ (or in this case, really the absence of a fact—thus an argument from silence). But, as our coelacanth example shows, the absence of human fossils in ‘dinosaur rock’ does not support the presupposition that dinosaurs lived millions of years before man. The famous Wollemi pine from Australia is yet another living example of something previously known from fossils only, and dated by evolutionists as existing millions of years ago. 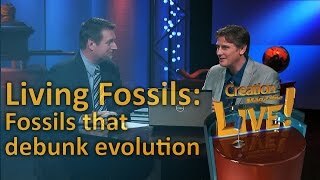 Creationists understand that the reason no evolutionary change is evident in the many living fossils, like this one discovered, is that there has been no evolution. The reason so many Christian professors (and Christian leaders in general) have rejected the literal creation position is that they have blindly accepted the interpretation of evidence from the secular world, based on man’s fallible presuppositions about history. So they have tried to reinterpret the Bible accordingly. Whenever you hear a news report that scientists have found another ‘missing link’ or discovered a fossil ‘millions of years old’—try to think about the right questions that need to be asked to question the questions these scientists asked to get their interpretations! And don’t forget, as Christians, we need to always build our thinking on the Word of the One who has the answers to all of the questions that could ever be asked—the infinite Creator God. He has revealed the true history of the universe in His Word to enable us to develop the right way of thinking about the present and thus determine the correct interpretations of the evidence of the present. We should follow Proverbs 1:7 and 9:10 that teach that fear of the Lord is the beginning of true wisdom and knowledge. Humphreys, D.R., Austin, S.A., Baumgardner, J.R. and Snelling, A.A., Helium diffusion rates support accelerated nuclear decay; in: Ivey, R.L. Jr., Proceedings of the 5th International Conference on Creationism, Creation Science Fellowship, Pennsylvania, USA, pp. 127–142, 2003; www.globalflood.org/papers/2003ICChelium.html. Stambaugh, J., The days of creation: a semantic approach, JOC 5(1):70–78, 1991. Grigg, R., How long were the days of Genesis 1? 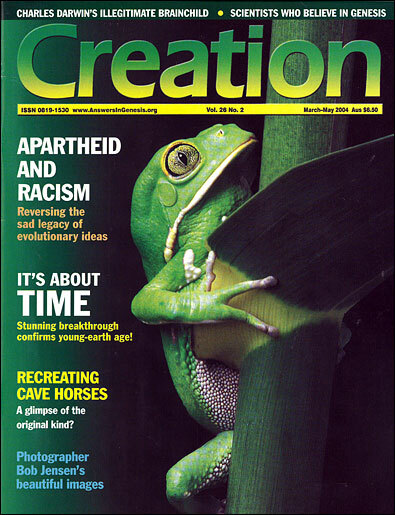 Creation 19(1):23–25, 1996. This is largely based on Stambaugh, ref. 2. Steinmann, A., אחד [echad] as an ordinal number and the meaning of Genesis 1:5, JETS 45(4):577–584, December 2002. Catchpoole, D., ‘Living fossils’ enigma, Creation 22(2):56, 2000. More ‘living fossil’ coelacanths, Creation 23(2):5, 2001. ‘Dinosaur tree’ behind bars, Creation 23(3):56, 2001. Scheven, J. and Wieland, C., Ghostly shrimp challenges evolution!, Creation 16(3):51, 1994. Wieland, C., Sensational dinosaur blood report! Creation 19(4):42–43, 1997. Schweitzer, M., Montana State University Museum of the Rockies; cited on p. 160 of Morell, V., Dino DNA: The hunt and the hype, Science 261(5118):160–162, July 9, 1993.